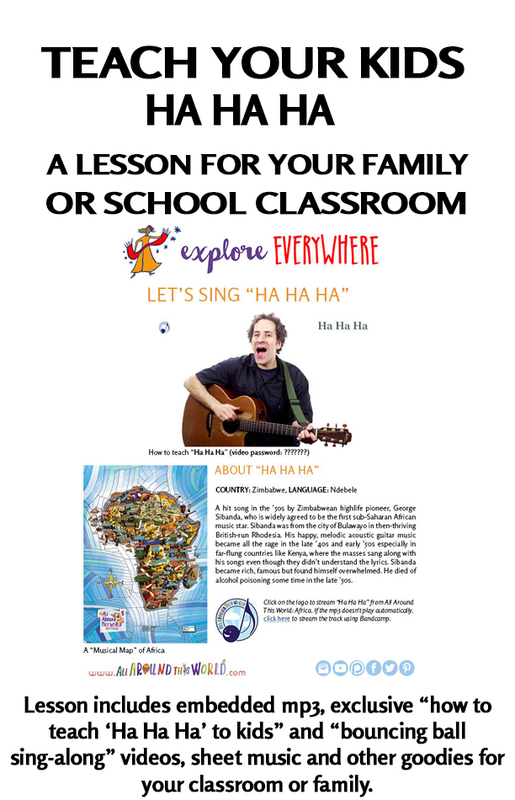 We call this our “African laughing song,” though its origins, and certainly its compser’s life, make its reality much more complex. A hit song in the ’50s by Zimbabwean highlife pioneer, George Sibanda, who is widely agreed to be the first sub-Saharan African music star. Sibanda was from the city of Bulawayo in then-thriving British-run Rhodesia. His happy, melodic acoustic guitar music became all the rage in the late ’40s and early ’50s especially in far-flung countries like Kenya, where the masses sang along with his songs even though they didn’t understand the lyrics. Sibanda became rich, famous but found himself overwhelmed. He died of alcohol poisoning some time in the late ’50s. Dali ngiyakuthanda bati, ha-ha-ha! (4x) Oh my baby how I love you, ha-ha-ha! (4x) Ha ha ha ha ha ha. Originally “Dali Ngiyaktuahda Bati Ha-Ha-Ha.” Written by George Sibanda. (c) International Library of African Music.